"This is a humanitarian crisis — a crisis of the heart and a crisis of the soul," Trump said, explaining why his request for $5.7 billion to build the wall and for additional border security measures is necessary. "The federal government remains shut down for one reason and one reason only: because Democrats will not fund border security. ... The only solution is for Democrats to pass a spending bill that defends our borders and reopens the government," the president said. Trump's address Tuesday night seemed, at least in part, a way to reassure nervous Republicans about the political cost of the shutdown, some of whom may be wavering as more impacts from the partial closure of the government ripple across the country. Trump and Vice President Pence will meet with Senate Republicans on Wednesday, and on Thursday Trump will visit the border to continue his media blitz. But in the nearly three-week-long shutdown, there still is no clear path to a resolution anytime soon, as both Trump and Democratic congressional leaders in their rebuttal offered nothing new beyond the arguments they've been making since last month. Unlike at his campaign rallies, Trump didn't begin his Oval Office address with his push for a wall. Instead, he first outlined what he says is an urgent need to address a growing number of migrants trying to cross the border and to address drugs coming across illegally. 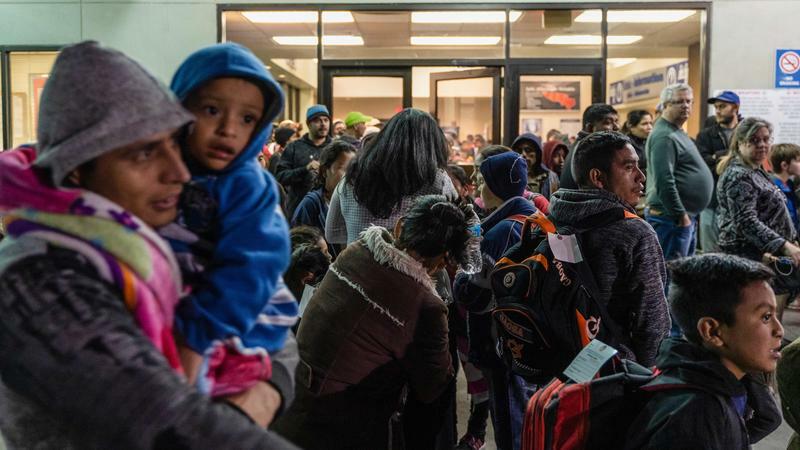 "Last month, 20,000 migrant children were illegally brought into the United States — a dramatic increase. These children are used as human pawns by vicious coyotes and ruthless gangs. One in three women are sexually assaulted on the dangerous trek up through Mexico. Women and children are the biggest victims, by far, of our broken system," Trump said. Trump also claimed that the "Southern border is a pipeline for vast quantities of illegal drugs" and that it was necessary to "stop the criminal gangs, drug smugglers and human traffickers." However, an NPR fact check found that according to the Drug Enforcement Administration, most illegal drugs come through legal ports of entry and only a small fraction comes through parts of the Southern border that would be impacted by a wall. Trump also tried to make an emotional plea, pointing as he often has to crimes and slayings committed by undocumented immigrants as another reason stricter border security is necessary. "How much more American blood must we shed before Congress does its job? To those who refuse to compromise in the name of border security, I would ask: Imagine if it was your child, your husband, or your wife whose life was so cruelly shattered and totally broken?" Trump asked, framing his argument as "a choice between right and wrong, justice and injustice." However, studies show undocumented immigrants in the U.S. commit crimes at a lower rate than native-born Americans. The Trump administration has tried to establish a link between terrorism and the situation at the Southern border, and on Tuesday night Trump said a "barrier is absolutely critical to national security." But he and his allies have often exaggerated the threat or simply used inaccurate or misleading statistics to do so. While there has been a spike in Southern border crossings in the past few months — largely children and families fleeing violence in Central America — overall illegal crossings are lower than in either 2016 or 2014 and far lower than their peak around 2000. Trump also tried to make the argument that the wall would be paid for, indirectly, by Mexico thanks to a new trade deal he has negotiated to replace NAFTA. However, that new deal has not been ratified by Congress, and as NPR's Tamara Keith has reported, there's no guarantee the economic gains could pay for the wall and the White House has not explained its math to back up that claim. White House press secretary Sarah Sanders also claimed last week that Customs and Border Protection picked up almost 4,000 suspected terrorists along the Southern border, but NBC News found those stops have largely been made at airports. During the first half of fiscal year 2018, CBP stopped just six immigrants at ports of entry on the Southern border who were on a federal terrorist watchlist, NBC also found. The president also claimed that "at the request of Democrats" any wall would be a steel barrier. However, that has not been a condition from Democrats. Rather, after long pushing for a concrete wall, Trump recently shifted to talking about using steel slats to build a barrier on the Southern border, hoping that might convince some Democrats, but it has not. 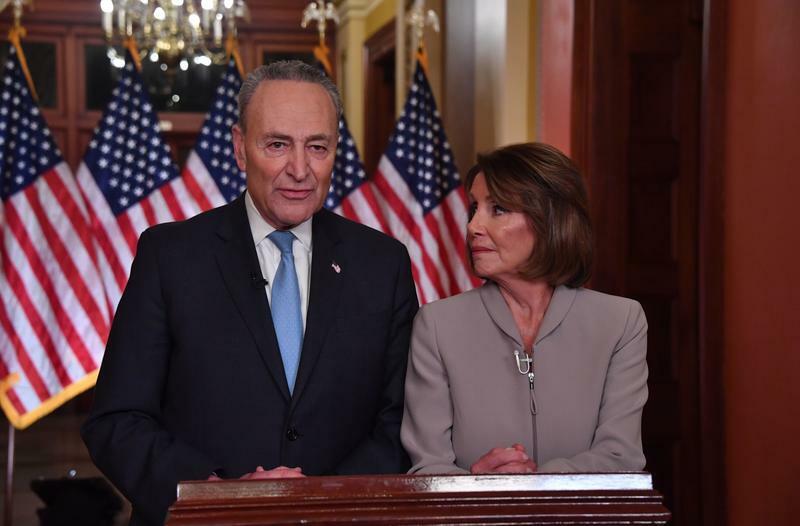 Democrats have remained in staunch opposition to any contingencies on reopening the government, arguing their victories in the midterm elections and public polling have shown the country doesn't want a wall. In their response following Trump's address, House Speaker Nancy Pelosi, D-Calif., and Senate Minority Leader Chuck Schumer, D-N.Y., accused Trump of trying to "manufacture a crisis, stoke fear and divert attention from the turmoil in his administration." "The fact is: President Trump has chosen to hold hostage critical services for the health, safety and well-being of the American people and withhold the paychecks of 800,000 innocent workers across the nation — many of them veterans," Pelosi said. "He promised to keep government shut down for 'months or years' — no matter whom it hurts. That's just plain wrong." Pelosi also pushed back on Trump's claims, saying that "the women and children at the border are not a security threat, they are a humanitarian challenge — a challenge that President Trump's own cruel and counterproductive policies have only deepened." Trump has said he won't sign any bill to reopen the government, about a quarter of which was shuttered on Dec. 22, unless Congress acquiesces to his request for $5.7 billion to build the wall — Trump's central campaign promise that received raucous applause at his rallies, albeit with the caveat that Mexico would pay for the barrier. Last month, Trump said he would be "proud" to shut down the government over border security and would gladly "take the mantle." However, since the partial shutdown became a reality, he has tried to shift the blame to Democrats. Tuesday night Schumer challenged Trump to reopen the government while continuing to negotiate on border security. "We can reopen the government and continue to work through disagreements about policy," the Senate minority leader said. "We can secure our border without an expensive, ineffective wall. And we can welcome legal immigrants and refugees without compromising safety and security." Last week, House Democrats passed legislation to reopen the government, though Senate Majority Leader Mitch McConnell, R-Ky., has said the Senate won't take it up — even though the Senate passed identical legislation last month before Trump reasserted his desire for billions in funding for a border wall. In a statement after the address, McConnell remained firmly behind Trump and sought to foist blame back on Democrats. "The past eighteen days have shown that Democrats' refusal to negotiate is not due to any principled objection, but simply due to partisan spite for the president," the Senate majority leader said. "For the men and women of the Border Patrol, for the safety of American families, and for all Americans who deserve a fully operational federal government, I sincerely hope my Democratic colleagues will come to the table and help deliver a solution."